Protects flooring including hardwood, tile and carpeting. Twice as thick as the LifeSpan Treadmill Mat. Made from recycled Nike shoes. won't compress or gouge like vinyl mats. Made in the USA. At 4 mm of thickness, still thinner that ideal. A bit outsized for office treadmills, leaving a lot of exposed rubber and creating a potential trip hazard. Because it is made of recycled shoes, not tires, the mat has colorful flecks in the rubber. 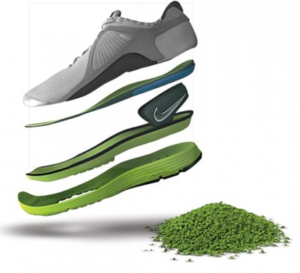 We applaud the creative re-use of old Nike athletic shoes that keeps them out of the landfill. And this mat is thicker than most, made in the USA, and won't have that odor of cheap, thin, Chinese-made PVC mats. The Nike Grind is an equipment mat designed for gym equipment, not the ideal choice for treadmill desk users who will want something thicker, smaller in footprint, and less visually obtrusive in their offices. The main reason for placing a rubber equipment mat under your treadmill is to guard against dust and dirt infiltrating the internal works of the machine. A basic mat will also prevent damage to the floor, and reduce noise and vibration. The thicker the mat the better in that regard. Treadmill mats, also generically referred to as equipment mats or anti-static mats, come in many sizes, thicknesses, and material quality—from cheap, thin, easily-torn PVC mats made in China to thick, durable, 100% rubber mats made in the USA. There are even cheaper mats available on Amazon. That said, you get what you pay for, which in this case is a mat that’s a bit oversized, a bit too colorful, and only two-thirds of the thickness of a high-quality mat designed specifically for use with a treadmill desk, like the iMovR RightSize™ Treadmill Mat. Most mats are designed for larger gym equipment like elliptical machines (wider footprint) or running treadmills (longer footprint), so their dimensions tend to be a little too large for a walking treadmill base. Besides looking ugly on your office floor, they create a trip hazard, and can run into the legs of your height-adjustable desk. Being oversized can in some situations make it impossible to center your treadmill on the mat, or force you to put one desk leg on the mat and the other on the floor, tilting your entire desk and causing undue sideloading on the leg actuators. The Nike Grind Equipment Mat is in fact just a generic gym equipment mat, and is a bit outsized for popular office treadmills. 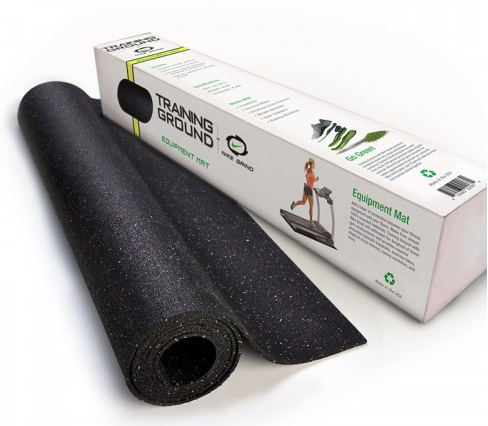 Ironically, LifeSpan Fitness resells the Nike Grind Mat alongside their own thinner, cheaper LifeSpan Treadmill Mat, to go along with their TR800-DT3, TR1200-DT3 and TR5000-DT3 treadmill bases. The LifeSpan and Nike mats are identical in footprint dimension, but the latter is twice as thick and has a colorful fleck pattern in the rubber. If your walking treadmill is even smaller in footprint, such as the iMovR ThermoTread GT or the Rebel 1000 Treadmill, the mat is going to frame your unit in even more exposed rubber. In general we recommend treadmill mats that are at least a quarter-inch (6 millimeters) thick. Thinner mats have a tendency to curl at the edges over time, which can pose a trip hazard. The Nike Equipment Mat ($69.99) is only 4 mm thick, which won’t provide as much shock absorption or noise reduction as the iMovR RightSize Treadmill Mat ($79.95), but will work much better than the LifeSpan Treadmill Mat‘s meager 2 mm of depth ($49.99). We’re not sure about its durability given that it is made of crumbled sneaker bits and is the same weight as the LifeSpan mat, despite being twice as thick. This concerns us because you should be able to move your treadmill on and off the mat without risk of tearing it. Perhaps that’s not a big issue if you don’t plan to clean under your treadmill very often, but the idea is that the mat should make it easier to do exactly that—and thus extend the life of your treadmill by keeping dust out of the belt works and motor. The static charge that builds up on a treadmill from the friction of the walking belt continuously rubbing against the plastic deck attracts dust in the air—and dirt from the bottom of your shoes—into the space in between. Over time as this dust and dirt accumulates, it makes it harder for the motor to overcome friction and increases power consumption. The bottom line is that you want to keep the static electricity down, the treadmill clean, and lubricate frequently to protect the investment you made in your treadmill desk workstation. Beware of mats made of PVC (vinyl), these are the cheapest but they’re not made to last, and their manufacturing process is much more harmful to the environment. For this reason most PVC mats are made in China, where the EPA isn’t around to enforce environmental laws. A good treadmill mat will be made of 100% rubber. A better mat will be made of 100% recycled rubber (typically from tires). The best mats, like the Nike, LifeSpan and iMovR treadmill mats, are also made in America. That says a lot about manufacturing quality as well as environmental sensibility. If you read the user reviews on cheap treadmill mats offered on Amazon you’ll also frequently read about unpleasant outgassing odors that no one needs in their office. Treadmill mats get dirty. But some mats can be ridiculously hard to clean from dust and footprints; again, not something you’d want to have to hassle with in your office. You want a nice, firm mat that can be easily cleaned without special chemicals, just soap and water. Better yet, getting a mat that is perfectly sized to your treadmill will keep all but a tiny surface area from being exposed, so you don’t have to hassle with keeping the mat looking nice. At the end of the day, even though a mat made in the USA from recycled rubber will cost a little more, it should last forever, saving money, time, hassle, landfill space, and a whole lot of pollution. (Note: Nike cannot, and does not claim this mat is made from 100% recycled rubber.) Our only issues with Nike’s equipment mat in this regard are the additional glue and chemicals required to turn sneaker molecules into a durable, flat mat, and the colorful flecks that are left in the mat. For office treadmill mats we prefer basic black, please. Nike does not offer a warranty on this product, which is one indicator that a low-density, 4 mm thickness is not going to endure much abuse. Compare to the 6 mm-thick iMovR RightSize™ Treadmill Mat made from 100% recycled tire rubber, which comes with a five-year, full-performance warranty. Free shipping is included in the price when purchased through Amazon Prime. The Nike Treadmill Mat is 36″ x 78″ x 4mm, and weighs 16.75 lbs. See our comprehensive Treadmill Mat Comparison Review or Top Anti-Static Treadmill Mat Reviews to learn more about the best treadmill mat for your walking workstation setup.